In this series, I’m looking at the impact of mathematical notation on student understanding and student learning. In the previous installment, I looked at a notation for “long subtraction” different from the standard USA way of writing it. The current post will not make sense without reading the previous post first. (We subtracted 5 from8 getting 3; tried to subtract 4 from 2 and needed to borrow; we place the fat dot over the third column from the right and proceed by subtracting 4 from 12 getting 8. For the leftmost column, we can’t do better than pull the fat dot down to the result, giving us •83 – and how shall we interpret this result? One way to interpret the •83 is to see it as 83 – 100, since we tried to borrow 100. The algorithm is indeed correct in that it showed that 28 – 45 = 83 – 100. Another way to interpret •83 is to see it as paying 100 and getting 83 back in change. 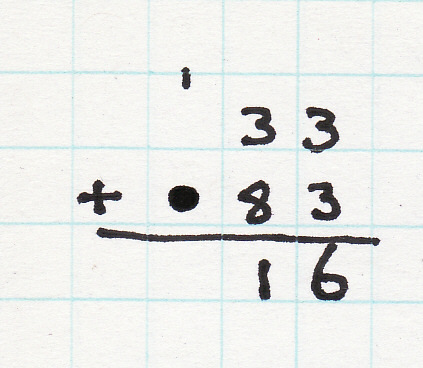 Yet another way of interpreting •83 is to see them as three digits in a three-digit number. Each digit has its place value. 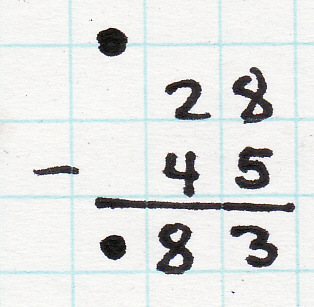 From right to left, the 3 is 3 ones, the 8 is 8 tens, and the • is some number of hundreds. How many hundreds? Well, the total result is supposed to be ⁻17, so working backwards, the • has to stand for negative one. So if we think of • as a digit, just like 0 or 1 or … 9, then the value of this digit is negative one, and the value of • in a number depends on the place value in the normal way. Allowing • as a digit in a number has benefits. I’ll be brief on these in this post, as the series is mostly about notation as such. One benefit for writing •83 for ⁻17 is that it helps in adding positive and negative numbers. We add in the standard way, starting in the ones column, giving 3 + 3 = 6. I the tens column, we add 3 + 8 = 11, writing down the 1, and carrying the ten tens as 1 hundreds. 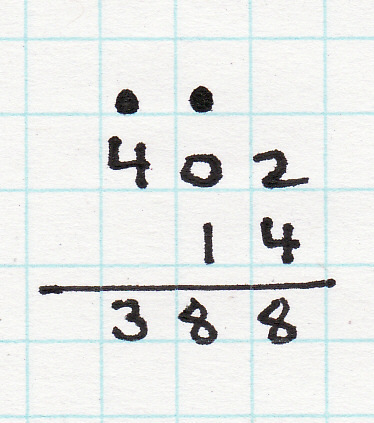 In the hundreds column, we have the 1 that is carried in, and add it to the fat dot, which treat as an injunction to subtract 1 – or alternatively, as an injunction to add a digit with value of negative one. The net effect is that there are no hundreds. We could have a written a zero, but of course we all know that leading zeros don’t affect the value of the number. On the left, we have various ways of writing positive 16, on the right, we show various ways of writing negative 17. The first one, •83 represents negative 17 as 83-100; the second one, •983 represents negative 17 as 983-1000, etc. This can also be read as: paying 100 and getting 83 in change, or paying 1000 and getting 983 in change. It is a nice feature of our common number system that it is easy to tell if different ways of writing the same number are equivalent. This feature is often under-appreciated. Typically, we don’t even think of 0016 as the “real” way to write the number sixteen. We tend to think of 16 as the real way to write sixteen, and 0016 as weak and rather useless variant. For our notation for negative numbers, we might likewise settle on •83 as the “real” way to write negative seventeen, and treat •983 or •9983 as less desirable variants. The notations I’ve suggested in this post for negative numbers may have seemed completely strange and arbitrary to you, not to mention impractical. Given our backgrounds, •83 simply doesn’t look like negative seventeen, and why would one want to even consider •83 as the way to write negative seventeen? But •83 is not impractical: it is the standard way by which computers represent negative numbers. Whether your computer is a PC or a MAC or whether you are reading this post from your cell phone, all these have processors that represent negative numbers in a way consistent with what I have sketched here. In the binary number systems used in computers, this way of representing negative numbers is called “two’s complement” and described in this Wikipedia entry. The decimal version of it, as shown in this post, is known as “ten’s complement”, and more details can be found in this Wikipedia entry. The notion of using the same fat dot from the subtraction algorithm as a marker for negative numbers in ten’s complement notation is my own. Anyone who has rolled a mechanical counter backward past zero has seen this notation. This is also exactly how negative numbers are shown on old calculating machines. Have you also tried multiplying these numbers? Try multiplying •8 by •7 out on paper and see what you get.